President Andrew Jackson’s conflict with the Second Bank of the United States was one of the most consequential political struggles in the early nineteenth century. A fight over the bank’s reauthorization, the Bank War, provoked fundamental disagreements over the role of money in politics, competing constitutional interpretations, equal opportunity in the face of a state-sanctioned monopoly, and the importance of financial regulation—all of which cemented emerging differences between Jacksonian Democrats and Whigs. As Stephen W. Campbell argues here, both sides in the Bank War engaged interregional communications networks funded by public and private money. 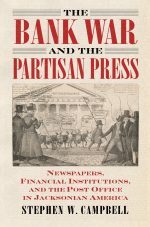 The first reappraisal of this political turning point in US history in almost fifty years, The Bank War and the Partisan Press advances a new interpretation by focusing on the funding and dissemination of the party press. 1. What’s your elevator pitch forThe Bank War and the Partisan Press? How would you describe the book in two or three sentences? This book explores one of the most important political conflicts in the nation’s history prior to the Civil War. My unique take is to put newspaper editors front and center. As I show, both sides in this drama engaged interregional communications networks funded by public and private money in order to propagate ideas and sustain their livelihoods. 2. What led you to research and write about the Bank War? During the first semester of my master’s program at CSU Sacramento, my advisor had me read Arthur Schlesinger, Jr.’s The Age of Jackson. I walked into the library, opened up the table of contents, and recalled how much I loved the Bank War from an AP US History class I took in high school. I suspect this is somewhat unusual in that despite the efforts of various mentors along the way who encouraged me to take this project in directions that were more marketable, flashier, and sexier, I pretty much stuck with the same topic for well over a decade. As for why I was attracted to the political and economic history of the antebellum era in the first place, I have always found that question difficult to answer. It’s kind of like rationalizing one’s aesthetic tastes and preferences. You may know that you like strawberry ice cream over vanilla, or reggae music rather than classical, but you have a hard time explaining why. Understanding the banking system during the antebellum era, which was very different from our current system. At that time, there were hundreds of different state-chartered banks, each circulating their own currencies of differing qualities and values backed by gold and silver. Contemporary financiers corresponded with one another in ways that appear to modern readers as dense, technical, and borderline unintelligible. Moreover, bank balance sheets and bank-related commentary from financiers and politicians did not use a standard terminology. In my view, most historians and economists have not done a very good job explaining this intricate system in simple terms to the average reader. It took me several years to fully understand the credit system (keep in mind that most professors spend most of their time teaching). But all of that work had to be condensed down to a few pages in the appendix. Sometimes there is a tremendous amount of research that goes into the writing of just a few sentences or paragraphs. 4. Your book advances a new interpretation of Andrew Jackson’s conflict with the Second Bank by focusing on the funding and dissemination of the party press. How is your interpretation different from previous conclusions? Most accounts of the Bank War rely on a relatively narrow range of sources. They quote a few famous letters from the chief antagonists, Jackson and Biddle, and recapitulate received wisdom. My book, in contrast, covers a wider array of sources in order to bring a group of semi-elite and middling actors to the fore—the newspaper editors, postmasters, and financiers who took orders from Jackson and Biddle and at the same time found subtle ways to shape the manner in which the Bank War unfolded. When one gets into the finer details of some of these episodes, one discovers that the received wisdom is either misleading or simplistic. In addition to offering a somewhat different periodization, I argue that Biddle developed a complex, interregional corporate lobbying campaign and that the president’s decision to remove the Bank’s public deposits was tied into a little-known scandal involving the Post Office. 5. Your book contextualizes the Bank War within larger political and economic developments at the national and international levels. Can you draw any parallels between the events in Jacksonian America and the current political climate? While I do believe that making connections between past and present is one of the most common and effective ways to make history meaningful for students in the classroom, I have been hesitant to do this in my scholarship. Don’t get me wrong, I’m not some sort of purist who believes that it’s even possible to narrate an “objective” history. But the 190-year period that has transpired between Jackson’s presidency and today renders tenuous any direct connections. At the time, the size of the US economy was about $1 billion, but it is approximately $20 trillion today (20,000 times bigger). Agriculture accounted for almost 80% of the workforce, but it is less than 5% today. And of course, slavery was fundamental to not just the political, economic, and social structures of the South, but the entire nation, too. I almost wish that it was easier to make those direct connections since so many people, both within and outside of the academy, think that history can only be “relevant” if there’s a direct application to our own lives today. But you also can’t force it because doing so would sacrifice the complexity of our own times and back then. So with all of those caveats in mind, there are some very broad themes and questions that come up in my book that are still with us today: the problem of state-sanctioned monopolies, especially in the financial sector; an overbearing president who disregards norms; corruption of the public trust; checks and balances; prioritizing political loyalty rather than meritocratic competence in the appointment process; media bias; and especially, how corporate money can corrupt the press and our elections. I also hope readers pick up on the complex interplay between individual agency and larger structures, which holds true for any period of study. Despite our national mythology, Americans’ success or failure in life is rarely determined by hard work alone. A lot of white men in the Jacksonian era experienced social advancement merely by having the right friends and political allies while conversely, a lot of hard-working and talented people could soon find themselves unemployed through no fault of their own when those periodic financial panics hit. Some books make a big splash by covering an understudied topic or by overturning conventional wisdom and taking the historiography in new directions. Others are founded on deep research and contain a variety of sub-arguments that provide new insights on long-studied topics. Without selling myself short, I do believe my book falls into the latter category. It may take some patience, but if readers consider the work as a whole, they will, I hope, see it as a valuable contribution to our understanding of the politics and economics of the Jacksonian era. Besides my parents, for whom this book is dedicated, I’d probably gear this book toward the hypothetical person who sympathizes with Nicholas Biddle and believes that Andrew Jackson was an insane, ignorant fool for destroying the nation’s central bank. It’s not my place to say whether that view is right or wrong, but it is a common view to have, and indeed, I maintained something approximating this view upon starting this project. Further research, however, compelled me to take the Jacksonian position seriously, even if I did not always agree with it. I hope this perspective—that of explaining why something happened rather than taking a side—comes across clearly to readers.